"Birthright" was released as a promo single in Norway at the end of October. It features only the track "Birthright" (3:45) and comes in a card wallet style sleeve. 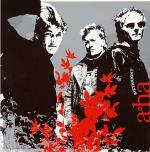 The cover of the sleeve features a shot of the band (Morten, Magne, Paul) against a grey background, taken from the same photo-shoot as the photo used on the album cover. At the bottom of the picture, there's some red leaves and grey birds, again of similar design to the album cover. "a-ha" is printed in red letters on the right hand side with the title in white printed over the second "a". The reverse of the sleeve is red with more white and grey patterns. The title is printed in grey with additional text printed in white beneath. The disc is also red with white and grey leaf patterns, the "a-ha"-logo in white and title in dark red.